We all know that the world was supposed to end in 2012 but we are still alive today and it might just be that a skilled player dared to try and save the world in this cool adventure game. You will have to rotate the earth in such a way that the asteroids will collide with water and not with the buildings. If they do hit however, you can catch the water particles and hopefully put out the fire. Your ultimate goal is to try and build monuments all around the world thus giving you a higher score whenever you dodge a meteorite. Have fun and keep Terra safe for as long as possible. 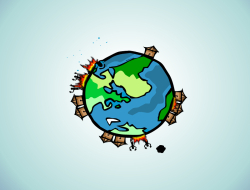 Use the arrow keys to rotate the earth. Survive 2012 0.00 between 0 and 10 based on 0 votes.